The timing belt connects the crankshaft with one or more camshafts, and it also drives the water pump in many engines. It allows the engine to move the valves while keeping them synchronized with the pistons. It is often called a camshaft belt, or a camshaft chain because some engines use a chain instead. A belt breakage can cause major damage to an engine, so the belt should be replaced at regular intervals, even if it shows no sign of wear. Replacing a belt is a complicated task but it can be done at home by someone who is not a mechanic. The timing belt is located on the end of the engine, and runs perpendicular to the crankshaft and camshafts. Most vehicles conceal the timing belt and cogs behind a large cover to prevent dirt and water from reaching them. The belt is a thin rubber strip about one inch wide, with many teeth for gripping the cogs. It is several feet long and passes over many cogs. Most belts are made from a synthetic rubber compound with a hard polymer coating on the teeth to reduce wear. There are also fiberglass threads running through it to improve tensile strength and increase service life. The primary function of the timing belt is to turn the camshafts using torque from the engine, while keeping them synchronized with the pistons. As the camshaft rotates, bumps along its length push against rocker arms. A rocker arm opens a valve by pushing down on the top of its stem. When the rocker arm moves away, a spring around the valve pushes it shut. The secondary function of the timing belt in most engines is to drive the water pump. The pump moves water around the engine block and cylinder heads, absorbing heat which is then released through the radiator. A belt is cheaper and quieter than a chain but does not last as long. Whether a belt or chain is used depends on the type of engine. An interference engine is one where the piston and valves in each cylinder must remain synchronized or they will impact each other. Timing chains are normally used for this type of engine to minimize the risk of damage, because they are more reliable than belts. 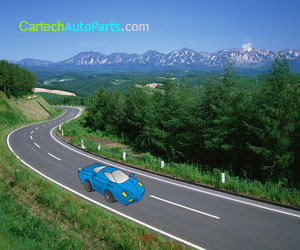 In a non-interference engine, there is no risk of collision so a timing belt is normally used. Replacing a timing belt is one of those complicated and time consuming tasks that is best left to a mechanic. Many engine components need to be removed just to reach the timing belt, and it can easily take several hours to finish the task. Without experience, there is also a good chance that one or more components will not been put back correctly, requiring more time to be spent fixing the engine. However, vehicle owners can save hundreds of dollars by doing it themselves. The first step is to remove the cover over the timing belt and cogs. Move any accessories in front of the cover and then remove the bolts holding the cover. Look for the the timing marks on the crankshaft and camshaft pulleys and mark their position on the engine block. They must not move while changing the belt so that everything remains synchronized. Loosen the bolts holding the tensioner pulley and move it out of the way, and then pull the belt off the sprockets. It is a good idea to replace the water pump while changing the timing belt, since pumps are cheap and also prone to failure. Once the new pump and belt are installed, move the tensioner pulley back into place and tighten the bolts holding it. Check that the timing marks have not moved and then replace the cover, and also put back any accessories that were removed. This is only a basic description of the steps required to change the timing belt. Always refer to the service manual first to check if there are any additional steps required.